If the Bush tax cuts had not been extended at the start of this year for almost all households, the public debt to GDP ratio would be falling rapidly. Even though health care costs are rising and Social Security payments will need to increase as baby boomers retire, the US would be generating more than sufficient tax revenues to cover such costs, if we simply had reverted to the tax rates that held prior to the Bush tax cuts. The figures on this can be calculated from numbers provided by the Congressional Budget Office with its annual Long-Term Budget Outlook, which was published earlier this week. Most of the attention paid to the report focussed on the base case projection by the CBO of the public debt to GDP ratio if nothing changes in current policy. The ratio had risen sharply as a consequence of the economic collapse of 2008, in the last year of the Bush administration, and subsequent weak recovery. But with the economy recovering and with other measures taken, the ratio is now projected to stabilize and indeed fall modestly for several years. However, the ratio would then start to grow again in fiscal year 2019, and especially after 2023. As the graph above shows, the CBO projects that, under current policy, the debt to GDP ratio would rise to 100% of GDP by fiscal 2038, reaching levels last seen at the end of World War II. This has been interpreted by Republicans as a runaway spending problem, and have asserted this calls for further sharp cuts. But the data issued by the CBO with its report allows one also to work out what the consequences were of allowing most of the Bush tax cuts (primarily – there were also some other tax measures) to be extended from January 1, 2013. The Bush tax cuts had been scheduled to expire on that date. They were instead extended and made permanent for all but the extremely rich (those households earning more than $450,000 a year, the richest 0.7% of the population). Specifically, the CBO provided in the projections it had made last year (in 2012) what public revenues would have been if the tax cuts had expired, as scheduled, at the start of 2013. The new report provides those figures for comparison, updated to reflect the new methodology for GDP that the BEA adopted in July. One can combine those revenue projections with CBO’s current projections of non-interest expenditures, along with a calculation of what interest would then be on the resulting (lower) debt, to estimate what the fiscal deficit and debt to GDP figures would then be. The resulting path of federal government debt to GDP is shown as the green line in the graph above. The debt to GDP ratio plummets. Instead of reaching 100% of GDP in fiscal 2038, it instead would fall to just 37% of GDP in that year. And a simple extrapolation of that line forward would bring the debt all the way to zero in a further 24 years. The extension of the Bush tax cuts for most households can therefore, on its own, more than fully account for the projected rise in the public debt to GDP ratio. With tax rates as they had been under Clinton, there would be no debt issue. 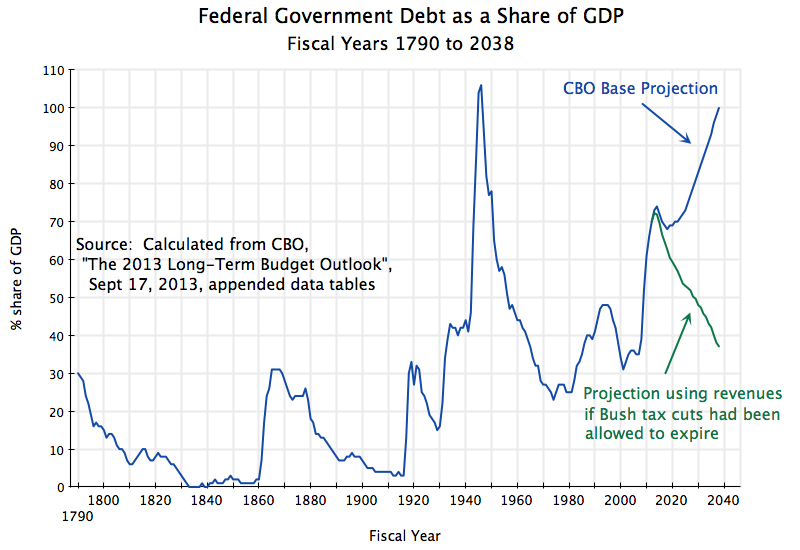 The CBO report also provides data on the federal government debt to GDP ratio going back to the founding of the republic in 1790. I have put the projected paths on a graph with the history to put them in that context. The fall in the debt ratio that would follow if the Bush tax cuts had not been extended is similar to the falls seen in that ratio in the periods following the Revolutionary War, the Civil War, World War I, World War II, and during the Clinton years following the run-up during the Reagan and first Bush presidencies. Public debt reached a peak of 106% of GDP in fiscal year 1946, at the end of World War II. The ratio then fell steadily in the 1950s and 1060s, and was just 25% in 1981, at the end of the Carter presidency. It fell during this period not because there were large budget surpluses, but rather because of generally strong economic growth. This also shows that strong growth is possible even if the debt ratio is as high as 106%, undermining the argument made by the economists Carmen Reinhart and Ken Rogoff in a 2010 paper, that debt in excess of 90% of GDP will lead to a sharp reduction in growth. Republican politicians had quickly jumped on the Reinhart and Rogoff conclusion, arguing that this work supported their views. But aside from numerous counterexamples, such as the US after World War II, researchers later discovered that there had been a coding error in the spreadsheet Reinhart and Rogoff used to assemble their data. More fundamentally, researchers showed that to the extent there is a relationship between high debt and slow growth, it is that downturns and slow growth lead to a rise in the debt to GDP ratio (as we saw in the US after the 2008 collapse), rather than that a high debt ratio leads to slow growth. The debt ratio then rose sharply during the Reagan and first Bush presidencies, rising from 25% of GDP in fiscal 1981 to 48% in fiscal 1993. This was the first such rise in the debt ratio in American history, aside from the times when the country went into war or at the start of the Great Depression. During the Great Depression the ratio rose during the Hoover years from 15% in fiscal 1929 to 39% in fiscal 1933, and then to 43% in fiscal 1934. But it is interesting that during the Roosevelt presidency, and in stark contrast to the common view that the New Deal was characterized by big increases in government spending, the ratio then stayed in the range of 40% to 44% until 1942, following the entry of the US into World War II. The debt ratio then fell during the Clinton presidency, from 48% in fiscal 1993 to 31% in fiscal 2001. But with the Bush tax cuts and then the 2008 collapse, the ratio rose to 52% in fiscal 2009, and to 73% this year. As noted above, the ratio would now start to fall again if the Bush tax cuts had not been extended, reaching a projected 37% in fiscal 2038. But with most of the Bush tax cuts made permanent, the ratio (with the same government spending levels) is instead projected to rise to 100% in that year. The first step in addressing some problem is to understand the cause. The cause of the current fiscal problems, which if not addressed would lead to a public debt rising to 100% of GDP by fiscal 2038, is the Bush tax cuts. An earlier post on this blog looked at what the debt to GDP ratio would have been had the Bush tax cuts never been enacted (in 2001 and 2003) and the Afghan and Iraq wars had not been launched. It found that even assuming the 2008 economic downturn would still have occurred, the public debt to GDP ratio would have risen only to about 35% by fiscal 2014, and would then start to fall. That post also showed that even assuming the cost of the wars and with the Bush tax cuts in place from 2001 to 2013, phasing out the tax cuts starting in fiscal 2014 would have led the public debt to GDP ratio to fall until at least fiscal 2022 (the last year in the CBO figures then available). The current post has made use of the CBO’s new long term projections, and finds that if the Bush tax cuts had not been extended at the beginning of 2013, the debt to GDP ratio would be on a sharp downward path to at least fiscal 2038. The current conventional wisdom appears to be that rising health care costs and the increase in the number of retirees as the baby boom generation reaches 65 means that a rise in the debt to GDP ratio is inevitable, unless there are sharp cut-backs in Medicare and Social Security. But that is not the case. The debt ratio would be falling rapidly if it were not for the Bush tax cuts. This entry was posted in Fiscal Issues and tagged entitlements, fiscal deficit, government spending, policy, public debt, tax system, taxes by aneconomicsense. Bookmark the permalink.